You're all skin and bones! Here, have some meat. And yet, no weight was gained! As it turns out, the 15x8 (Bassett Racing) steel wheel with 205-width tires that came on the car weigh about as much as a 15x9 6UL with 245-width rubber (17+19 vs. 13+23 lbs per corner respectively). I know everybody and their brother’s husband’s hairdresser’s Miata runs 6ULs and the color doesn’t match up particularly well with the rest of the car, but having something with the right offset was too good to pass up. 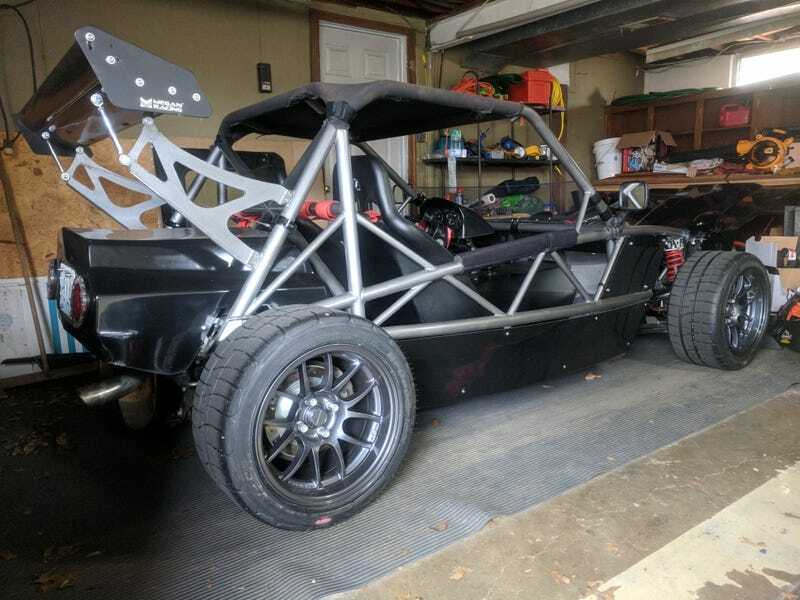 The frame bows out just enough that the rear tires will rub on it unless they have a pretty low offset, so wheel choices for wider rubber are limited and many require spacers. These 6ULs hit the market late last year in an Exocet-minded +12 offset, so I grabbed a set during the car’s winter hibernation. I’m happy to report that they clear the frame as advertised, but unfortunately they now rub my front brake lines at full lock, so some bracket changes are now in order. I was planning on putting a set of Hankook RS4 on them, but those were back-ordered into oblivion everywhere I looked (2+ months), so it instead got one of the latest autocrosser favorites: the BFG Rival S 1.5. My wallet wasn’t particularly happy with the extra $50/tire hit, but I can’t say I’m too upset with the trade-off otherwise. I’m just happy to be done with those slippery DZ102s. Seat time has been limited since the change-over due to weather and some additional work needing to be done (like the aforementioned brake line brackets and a radiator fan that no longer wanted to hold on to the radiator), but I can say the car now has the stupid amount of grip it deserves. I can’t wait to finally drive it in anger at the KC SCCA Test & Tune event coming up here in a little over a week.